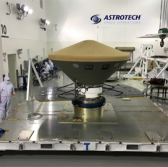 Lockheed Martin has shipped NASA‘s robotic Mars lander to Vandenberg Air Force Base in California to undergo final processing ahead of the spacecraft’s May 5 launch aboard a United Launch Alliance-built Atlas V 401 rocket. The InSight probe is designed to explore the red planet’s deep interior and map the planet’s basic structure to help scientists investigate how terrestrial planets are formed, Lockheed said Thursday. Stu Spath, Lockheed’s InSight program manager, said the company worked with NASA’s Jet Propulsion Laboratory to design and manufacture the spacecraft. The company will also oversee test, launch processing and spacecraft flight operations as part of its contract with the space agency. Lockheed transported the 1,380-pound lander from Buckley Air Force Base in Colorado to Vandenberg AFB using a transport aircraft from the Air Mobility Command.